Our neighbor was going on vacation and had a bunch of roses at home, so she gave them to us. A few weeks later, we still had those but they look a lot less fresh than when we got them. They looked to me like of a bunch of soldiers who had died on the field during a fight. Hence the title. beautiful... rich and just beautiful. I hear elegies and violins. The deep colors are gorgoeus, especially in the first rose. ...or déshydratation: nice color, nice focus and planning; great shot. 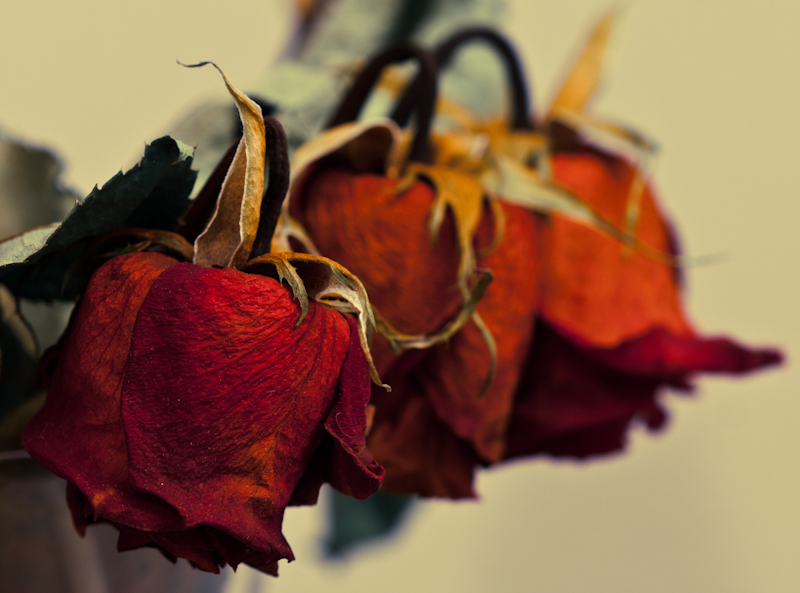 Flowers might just be the only things that remain beautiful, even when they're dead. Proudly hosted by Sargasso Networks. Current Server Time: 04/23/2019 12:06:36 PM EDT.